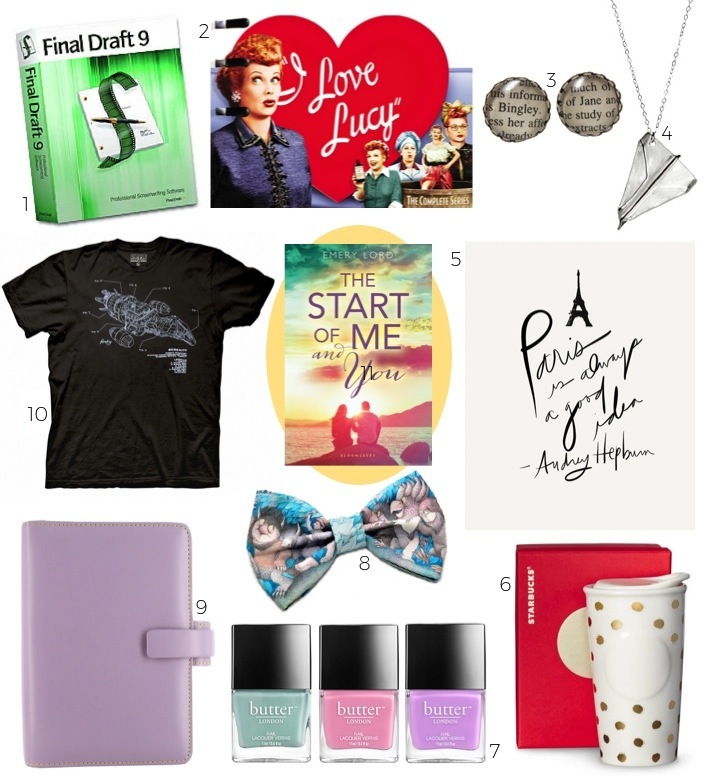 Back in December, Cassie and I posted our Favorite Factor Gift Guide. I had so much fun finding gifts inspired by books that I'd loved, and I knew I wanted to do it again! 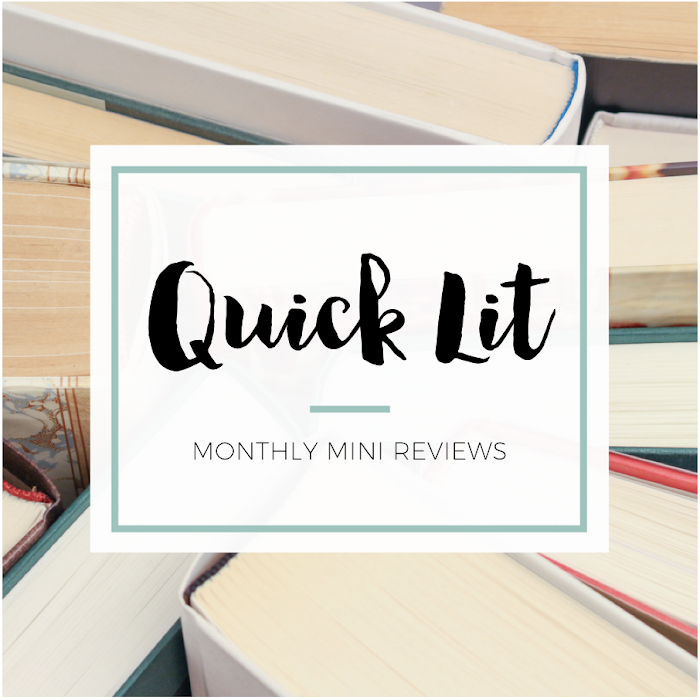 After creating a gift guide for The Liza Palmer Party and a gift guide for The Orphan Queen blog tour, I realized that I wanted to make this a regular feature. I'm calling it Buy the Book - a little play on "by the book" since all of my gifts will come directly from quotes or scenes in the book featured and, you know, since it's all stuff you can buy. I'm also going to include a snippet from the book for each item so you'll know exactly why I picked it! I'm hoping to share at least one per month, but we'll see how it goes. And if you like book-inspired gift guides, the lovely ladies at Rather Be Reading have also shared some in the past (this Nantucket Blue one is my favorite!). "The script occupied the small, secret spaces of my days, though I'd never planned to do anything with it. At least I hadn't until I discovered a summer screen-writing program at New York University." 1. Final Draft 9 ($169) - Paige wants to be a screenwriter, so I picked this software to help her pursue her passion! While it's not a huge aspect of the book, it's a central part of Paige's dreams for her future. "It was my grandmother who taught me that TV shows start with writing. We were watching I Love Lucy when I was eleven, and I said, 'Lucy is the funniest lady ever.'" 2. I Love Lucy: The Complete Series ($142) - Paige's relationship with her grandmother is a huge part of the book. I love books that deal with family, but it was extra special to see Paige's love for her grandma! "My parents just liked the name Paige, I think, but Elizabeth is because my mom is a huge Pride and Prejudice fan." I thought for a second. "I don't think I've ever told anyone that, actually." His head jerked toward me. "Really?" "Yeah. Guess it never came up. Elizabeth is a pretty standard middle name." "No," he said. "I mean really 'Elizabeth?' You seem much more like a Jane Bennet." My jaw dropped in offense. "That's kind of mean!" "No, it's not! Jane is deeply underappreciated." 3. Pride and Prejudice "Bingley" and "Jane" Earrings ($9) - When I saw the Pride and Prejudice reference, I knew Paige and Max were my kind of people. And I particularly loved Max's defense of Jane and Bingley! "There were at least fifty paper airplanes that I could see, made from all different patterns of paper. They were attached to a string, suspended around the room, as if flying in neat lines. I thought of the note Max had passed me earlier in the week, folded into a tiny plane." 4. Sterling Silver Paper Airplane Necklace ($70) - Max's love for paper airplanes is quirky and nerdy! I love that he proudly displayed them, and I can just imagine Paige wearing a paper airplane necklace for him. "Why not Paris? My world had crumbled around me. Like your friend Mr. Chase, I found a place to dance." 5. Paris Is Always a Good Idea Audrey Hepburn Quote Printable ($9) - Paige's grandmother helps her to move forward from her grieving, and she's also the inspiration for several items on Paige's plan to begin again. "Whatever happened next with my parents, my friends and I would still be here trading stories and sips of our lattes. Together, we made four walls, holding each other up even as the world around us shifted." 6. Starbucks Double Wall Traveler Gold Dot ($19.95) - I absolutely love the friendships in this book! Paige, Tessa, Kayleigh and Morgan are always there for one another, and it's so refreshing to read about friends like these. "Morgan insisted on painting my nails every weekend while we marathoned TV shows. It seemed so silly, so pointless. Until I looked down at my mint-green or petal-pink nails in class: one beautiful, glossy thing in my life. My friends added the first colors to my black-and-white world." 7. Butter London Nail Lacquer in Fiver, Fruit Machine & Molly Coddled ($15) - I had to pick one more thing to represent Paige's friends. They add so much to the book and made me wish I had a group like this of my own! "Although, when I was little, I thought I was named after Max from Where the Wild Things Are." 8. Where the Wild Things Are Bow Tie ($13.99) - While Max is not named after this character, I couldn't help but include something related to this classic children's book! I mean, maybe he could wear it to prom? "When Tessa bought me the planner a few Christmases back, I knew she was kind of teasing me about what she called 'type A tendencies.' But I didn't care. 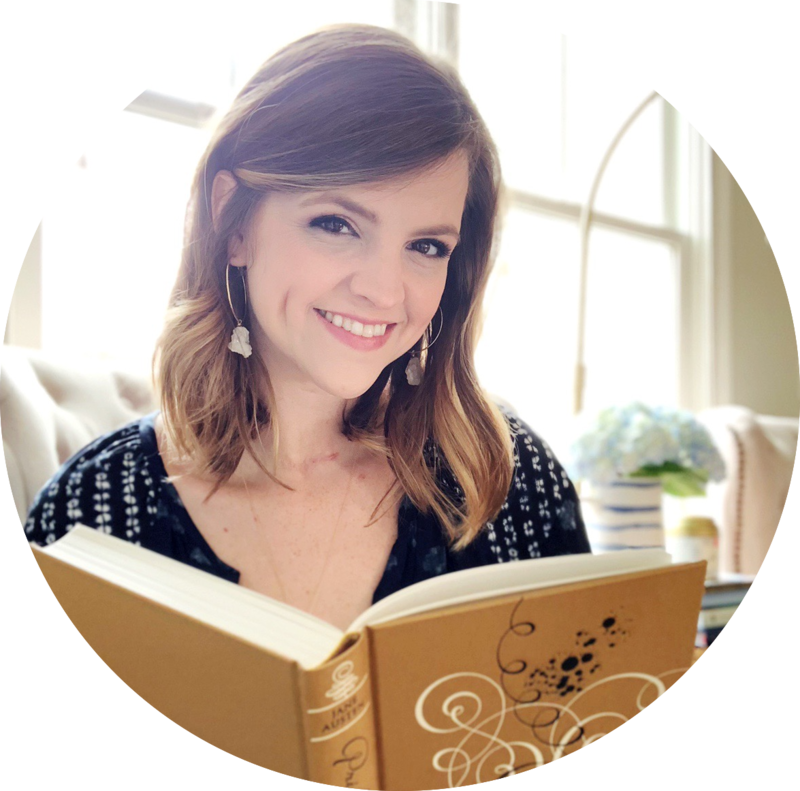 It was love at first sight: lavender leather with my initials embossed in the corner and pages of clean white paper, segmented into weeks and months." 9. Filofax Metropol Lavender Personal Organizer ($34.95) - Although this is Paige's actual planner, I thought this one still worked. As a huge planner nerd myself, I just had to include this item! "'Sure,' I said, snapping out of my tactless staring, and we stood there in the foyer for a moment as I glanced at his shirt - a black tee with some sort of spacecraft and the word 'FIREFLY' across the top." 10. Firefly Serenity Diagram Black T-Shirt ($15.79) - This isn't exactly the shirt Max wears, but it's close enough. I loved the nerdy references throughout the book - and the way Max and Paige tease each other about them! I love this selection--especially the earrings. They're so fun. Oh I am going to LOVE this feature!! Fantastic idea! I really love the way that paper airplane necklace looks! And I'm a little obsessed with the colors you chose for the Filofax and the nail polish - so perfectly pastel and spring. I'm actually really just in love with this entire post, and how you've chosen to execute it. Cannot wait for more Buy the Book posts! Gosh this is SUCH a cute a idea!! I have been spying on filofax instagram posts for a while now, and the other day I looked at all the models available... let's just say I can understand why people buy like 20 of them. Too bad I can't really think of a way that I would use one consistently in my life! I sooooooo love this feature! I also totally love that you included quotes (quotes are so my favorite thing)!!!! This is an adorable feature! I love the bow and earrings, its so cute! Wonderful post, love it.